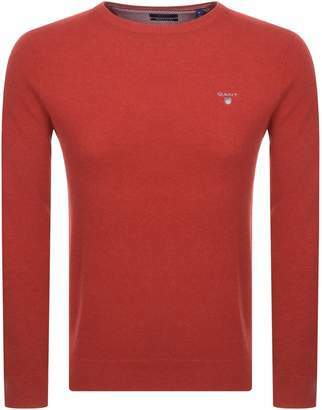 Gant Crew Neck Cotton Pique Knit Jumper In Dark Red Melange. A ribbed knit crew neckline with a ribbed knit waistband and ribbed knitted cuffs on the long sleeves. The signature embroidered Gant Shield logo is situated on the left of the chest in grey, navy, red and white. 100% Cotton. Stockists Of The Brand New Collection Of Gant Jumpers, Sweaters, Hoodies And Track Tops Available Live Online.